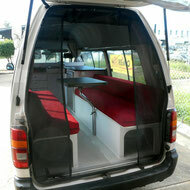 Are you a DIY builder or you would like to upgrade your Camper? We would like to make this parts available for our valued customers to improve their Campervan and Motorhome experience. If you looking for something we have not listed- please contact us and we will assist. You can also check our larger Ebay store for more items listed there- however the website store offers better prices for the items which are listed here. We also freight worldwide like USA, NZ and Canada - please contact us for postage cost and time frames!